Is there a better alternative to Syte? Is Syte really the best app in HTML category? Will Syte work good on macOS 10.13.4? Syte lets you create stunning websites and publish them for free with one click - no coding required! Start from a blank canvas and create exactly the site you imagined. If you'd like to start from a template, you can do that too! 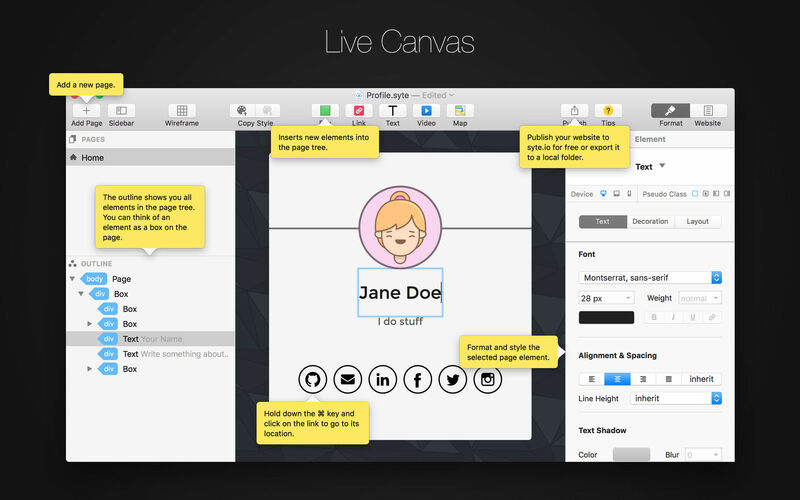 Live Canvas - What you see is what you get. You are always editing a live website, no preview required. Freedom to Create - Syte doesn’t restrict your creativity to templates. Build your site from a blank canvas the way you like it. If you prefer to start from a template, Syte offers those too! Retina Assets - Just choose an image and Syte will automatically generate single and double resolution images, so your images always look sharp. Responsive Design - Syte lets you specify styles for phone or tablet sizes. The canvas also reflects those as you resize it! 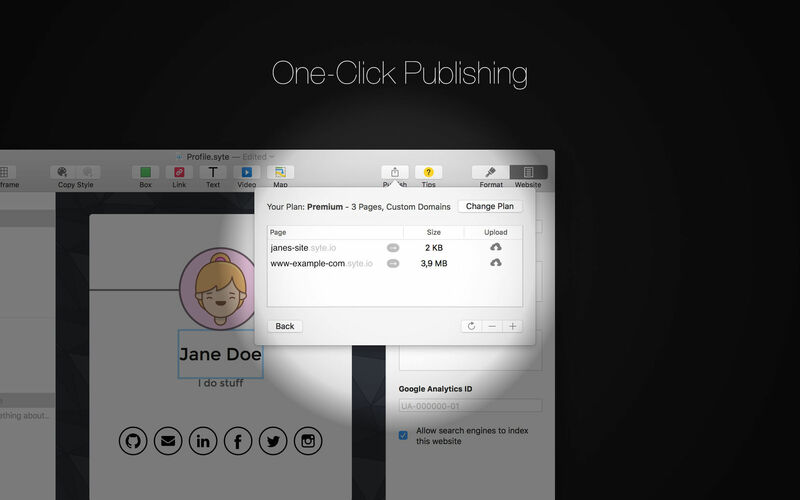 One-Click Publishing - Publish your pages for free with one click. You can even use your own domains. If you prefer to export them to a local folder you can do that too! Webfonts - Syte includes a collection of popular web fonts that you can directly use and preview in the editor. 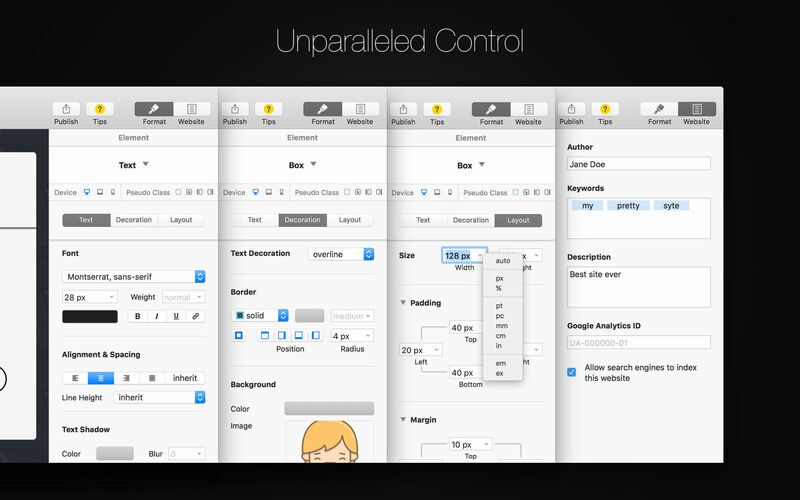 Unparalleled Control - Effortlessly copy and paste styles, move elements around or copy entire element trees by dragging in the outline. Carefully Crafted - Syte was built with the utmost care to feel like a first class app Apple would build themselves. Free - Oh, and did we mention Syte is absolutely free if you want to host your site on syte.io?